Roving festival programmer Neil Young brings us his latest report, from the 63rd Edinburgh International Film Festival. This latest postcard comes from rather closer to home than my previous dispatches, which winged their way to Bradford from Austria, Portugal and Romania. I haven’t even left the UK, though I am ‘north of the border’—at the 63rd Edinburgh International Film Festival. Now established in June (including some sweltering days this week!) after many years in August, EIFF is the world’s longest continually-running film festival, having kicked off in 1947—alongside the ‘official’ Edinburgh Festival—as a showcase for documentaries, especially Scottish non-fiction films. Six and a bit decades on, and the festival has expanded to cover pretty much every type of current cinema—and has long since been ranked as one of the country’s major film-related events, a magnet for film-lovers, industry bigwigs, and practitioners of the medium. And whereas at foreign festivals I usually represent Bradford solo, last week I was joined by BIFF’s Artistic Director Tony Earnshaw, programmer Tom Vincent, and festival producer Ben Eagle. So you can expect a selection of our favourites to pop up in the Bradford programme come next March. Before then, you should keep an eye out for Moon—a sparklingly inventive British science fiction brain-teaser whose UK release is scheduled for July (no coincidence that the release coincides with the anniversary of the Apollo lunar landing). Another of my EIFF highlights, Sin Nombre, comes out in August: it’s an incident-packed, stylishly-handled tale of migration and gang-violence set in Central America. Currently without UK distribution—but no less worthy of note—are Easier With Practice, a touching small-scale American indie that wouldn’t look out of place in our Uncharted States strand at Bradford, while from above the 49th parallel there’s Pontypool, a thumpingly enjoyable comedy-horror that gets round an evidently limited budget by almost entirely unfolding within the walls of a small-town radio station. Think early David Cronenberg with a 21st century postmodern twist. Apart from these newer features—Edinburgh presents itself as a ‘festival of discovery’, perhaps even the European answer to Sundance—I also got a kick out of the Roger Corman retrospective, especially the sumptuous Edgar Allan Poe adaptation The Masque of the Red Death (1964) and also his very atypically topical and political race-hate exposé The Intruder (1962)—starring an unfeasibly young William Shatner. Corman was here in person to introduce several of his movies and recount fascinating anecdotes from his amazing career via an on-stage interview with Kim Newman—delighting a packed audience that included one of his many successful proteges, Joe Dante (of Howling and Gremlins fame). This is quite a celebrity-studded festival, with red carpet screenings every night—including the annual appearance by Scotland’s living legend among movie stars (and the idol of our own Ben Eagle), Sean Connery. The festival wraps tomorrow with the UK premiere of Adam—I’ve been here since the opening night and, as Mr C might put it, I’ve been shaken and stirred. Over and out—for a little while, anyway. 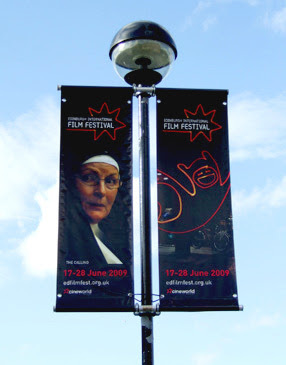 Neil was co-director of Bradford International Film Festival until 2014.